Design an office space that speaks to you and allows your best work to shine with the Amish Liberty Classic Lateral File with Optional Hutch Top contributing to your office furniture collection. The Liberty Classic provides your office with plenty of storage space for files and important documents. A 1" solid hardwood top and full extension drawer slides come standard with this Amish office furniture. Customize to create the perfect combination of options for your office. Select wood and stain; we are happy to send samples for your consideration. The raised panels and decorative molding of the hutch top are a sight to behold. This distinguished office furniture is full of function while providing your home or business office with an attractive style. 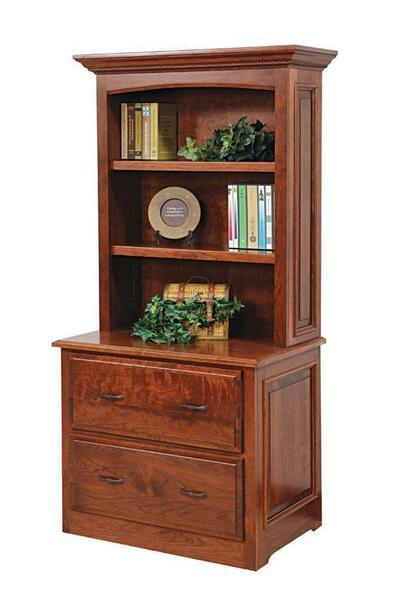 Consider the Amish Liberty Classic File Cabinet to use with this lateral file unit. Create the office you envision with our customizable Amish office furniture. Call us today at 866-272-6773 for assistance with your order.